This 7 day hunt is conducted out of the comfort of our main lodge. Each day we will use trucks, snow mobiles or side by sides to look for fresh tracks. Once we cut fresh sign our hounds-men can identify the tracks and make your hunt as easy as possible. We use well-trained hounds to pursue these beautiful cats. If you have never heard hounds as they close the distance on one of these elusive animals then it should be on your must do list! With our healthy population of mature animals and the vast expanse of unspoiled nature to support them, it allows us to continue to experience some excellent hunting opportunities! 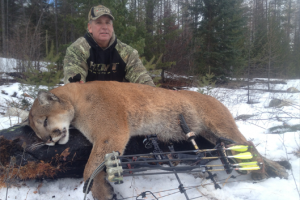 In addition to hunting cougar we offer the option to carry a Bobcat tag. These are beautiful animals that can be a completely different challenge and are an exciting addition to an already unique adventure!